But after a few dead ends I did find the samba in a bar in the Villa Magdalena neighbourhood of São Paulo – great band with Paula Sanchez and Paolo Serau who are aspiring to revive Broken Samba (Samba do Breque -here is a description in their own words “The style has as its main characteristic a pause in the musical accompaniment for a declamatory intervention of the interpreter. These pauses, known as “breque” – the Brazilian naming for the word “break” – consist of comic narrations about the plot of music, which may be texts previously written by the author, or improvised ones. Suddenly, the interpreter restarts singing her verses and the musical accompaniment comes back to scene, as a sort of challenge between the singer, the band and the people who are listening and dancing.”) …. If there is anyone who knows of a word in English that means one shop that sells one type of goods, kind of the opposite of a supermarket where one shop sells many types of goods, then I’d love to hear from you. In the absence of that I am going to make up a word – mono-market. This is the best description of the area around Mercado Municipal in downtown São Paulo. There is a store selling only umbrellas, or shoe laces, or a vegetable stall selling only oranges ….. and is more akin to Bhuleshwar in Mumbai, or Chandni Chawk in Delhi than the shopping malls of the western world. In São Paulo you have to go looking for the music, musicians and industry players … they are there if you search hard enough. 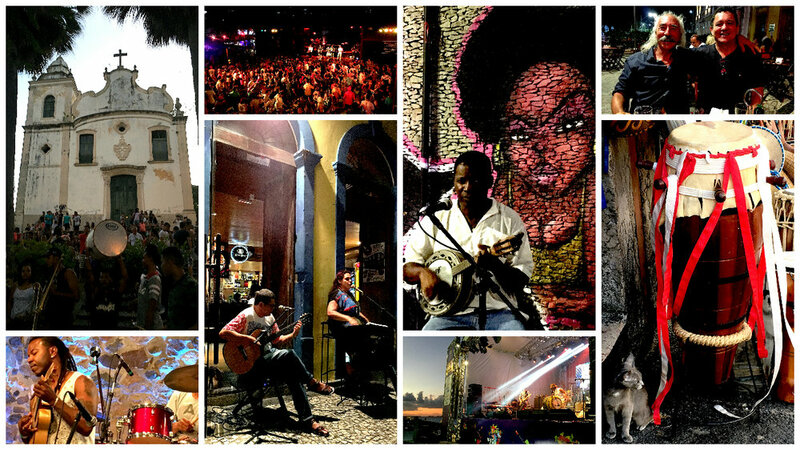 In Rio, the music is everywhere, you don’t have to look too hard. I was in the fortunate position of being with my son who is currently working there. So making his Copacabana flat a base, we head to the infamous Bip Bip bar for Tuesday night of chorro (a cross between bossa nova and samba), run by a formidable proprietor for over 50 years – an institution in Rio! You dare not chat while the music is playing or you’ll be at the receiving end of his tirade of abuse! But he served the chillest beer in the city (Brazilians sure know how to serve the coldest beer in the world. And note the #NoCoupInBrazil sign – a sign of the times). Pedro do Sal is the place where samba was born – here the slaves lived in close proximity to the docks and the ships that brought the free people of Africa and turned them into slaves. But the music and spirit of these people remained uncrushed. Today it is a vibrant colourful and magnetic part of Rio, and the soul of samba. The London Jukebox will definitely be bringing the sounds and colours of Pedro do Sal to London (though we can’t promise the Rio weather) – watch this space. Along with Copacabana, Ipanema, Christ do Redeemer, Escadaria Selarón (vibrant steps created by Chilean born artist Jorge Selarón) and Pão de Açúcar (Sugarloaf Mountain), Pedro do Sal is a must experience part of Rio. It was so good we went there twice!! No trip to Brazil is complete without a visit to the Iguazu falls – the largest waterfall system in the world with between 150 and 300 waterfalls (depending on the water levels and seasons). Words and photos cannot do justice to the staggering size and scale of the falls – we were lucky enough to be there during Xmas so there were less crowds and unparalleled views. And of course the Cariocas (people from Rio) know how to party. New Year’s Eve in Copacabana beach was no exception. Starting with sipping caipirinhas on the beach, continuing with pisco sours followed by champagne to toast the new year – the beach alive with cariocas in traditional white and sky filling fireworks, I got a small taste of what Rio might be like during carnival time. Before heading north and northeast in search of rustic gritty music, I was guided by my guidebook to take in Fiera de São Cristóváo, Rio’s version of northeast food and culture. And we found just that, beautiful swaying sounds of authentic forro. You cannot but tap to or swing a hip to the swaying rhythm of well sung forro. My resolve to find more forro and northern music was strengthened. So I headed for Salvador, the original landing point of Portuguese ships in Brazil (and a gruelling 35 hour bus journey from Rio!). What I find here is a vibrant energetic community, full of joy-de-vivre. And the music scene here was on par with that of Rio. First evening wondering through its colonial centre and I found this guy- bossa nova I suppose. Better still, these guys were playing Latin Jazz on the main square – this is Tuesday evening. There are more songs from Alafia on The London Jukebox – in South America Spotify playlist. Through Gini I also met with original musicians in Fortaleza, Roberto (from Chile) and Serau. A surprising genre of music that I discovered in Fortaleza was Brazilian reggae, a funkier slower sound in Portuguese. Most of the songs I heard were in cabs and performed by local artists and very much underground, the search for published Brazilian reggae therefore continues. I arrive at Recife hoping to hear forro, but am told that the city is in the throes of carnival preparations so Frevo is the music to catch. Seeing the rehearsals one might have thought the carnival is the next weekend, but it is next month – but these guys take it very seriously, and the city is preparing hard – I went to Orlinda to see the preparations.